Because of all the traffic problems on the Rainbow Bridge, the City of Folsom built the Lake Natoma Crossing just downstream in 1999. It is a 2300 ft long prestressed concrete box girder bridge. It includes three 328 ft long haunched girder spans over Lake Natoma, which was formed by Nimbus Dam just downstream from Folsom Dam. It provides four vehicle lanes, two bike lanes, and pedestrian walkways, and takes some of the traffic off the Rainbow Bridge. There are several interesting features on this bridge. For one thing it was designed with a lot of community input, which included the appearance of the bridge. There are a lot of embellishments reflecting the City of Folsom's 19th century appearance (brackets supporting the bridge overhangs and Victorian bridge columns). However, the most controversial element is the decorative arches that serve no purpose except to resemble the arch on the Rainbow Bridge just upstream. To me this is intellectually dishonest and gives the bridge an overdecorated appearance. 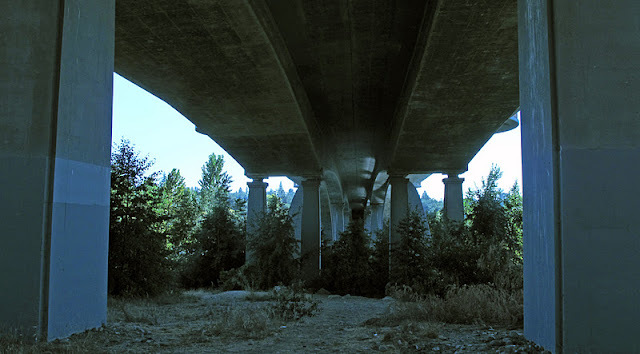 Apparently HDR (the designers) couldn't get a real arch bridge to work with the seismic and other restraints and offered this as a solution. It does match the overdecorated style of the Victorian era, although the parabolic shape seems more modern. The other interesting feature is the seismic design. The columns are supported on large-diameter pile shafts embedded into rock. The top of the columns have isolation bearings that allow the superstructure to move during an earthquake without putting large demands on the columns. Moreover, the superstructure was made with lightweight concrete to reduce the inertial force to the bearings. The bridge reflects the needs of the community and the various compromises that had to be made between the demands of nature and society. However, I don't think that Ayn Rand/ Howard Roark would approve. American River Bridges: Lake Natoma Crossing by Mark Yashinsky is licensed under a Creative Commons Attribution-NonCommercial-ShareAlike 3.0 United States License.